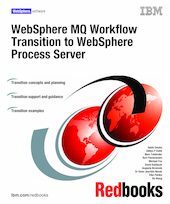 This IBM® Redbooks® publication provides guidance on how to transition from a WebSphere® MQ Workflow 3.6 environment to WebSphere Process Server V 6.1. It provides a conceptual overview of WebSphere MQ Workflow and WebSphere Process Server, describes new features provided by the WebSphere Process Server, and discusses benefits of a transition to the new environment. The book discusses the transition concepts available for converting a business process from WebSphere MQ Workflow to WebSphere Process Server. It compares human interaction in business processes in WebSphere MQ Workflow to people assignment in WebSphere Process Server and how to map from one to the other. Integration of back-end applications is described for both environments, together with information about how to transition from one to the other. This book compares how clients were implemented in WebSphere MQ Workflow and how the corresponding implementation is performed in WebSphere Process Server. It helps assess the topology in place in WebSphere MQ Workflow and define a corresponding one in WebSphere Process Server, as well as best practices for target topology high availability, scalability, deployment of applications, and administration. * Part 1 provides planning information required to assess the current environment, define the target environment, and plan for a transition from WebSphere MQ Workflow 3.6 to WebSphere Process Server V6.1. * Part 2 provides detailed information about transition techniques, areas for transition, tools available, artifacts involved, and best practices.